Gamblers players handed out teddy bear toss donations at pediatrics at Aurora BayCare Medical Center on Monday. 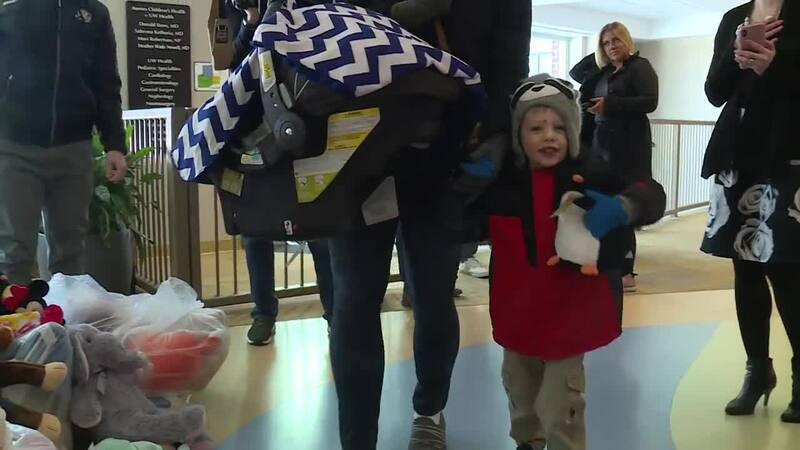 GREEN BAY, Wis. — "Little Little Little Penguin" is what 3-year-old Brennan Gajeski said he would name the stuffed animal he picked up at pediatrics at Aurora BayCare Medical Center on Monday. The stuffed penguin was one of 7,202 stuffed animals tossed on the ice at the Resch Center Saturday night, in the Green Bay Gamblers' 20th annual teddy bear toss. Gajeski was just one of a handful of smiling young faces to receive some of those donated stuffed animals directly from the players on Monday. "It's really nice," said Brennan's mom, Katie. "We weren't able to make it out to the game on Saturday, so for him to come and pick out a stuffed animal and to interact with the players is really great." "It's unbelievable," said Gamblers forward Austin Heidemann. "I mean, you look at how the kids look when they see the teddy bears -- we got a few hugs from giving them out -- so it's pretty crazy. Just the look in their eyes says it all. I'm just grateful that we were able to do this for the little kids and everything." Forward Noah Prokop recalled how much he enjoyed the teddy bear toss last year with the Gamblers, so when his shot found the back of the net Saturday, he was even more excited to notch a goal than normal. "It was raining bears," he said. "It was kind of cool. Put my hands up, and just let 'em fall." Heidemann, a first-year Gambler, was on the ice for the goal, too. He said he hadn't seen anything like that before. "It's unreal. I mean it was just almost a wave hitting you full of teddy bears," Heidemann said. "They kept hitting me in the head, but it was awesome. I don't know if I've ever been more excited to be on the ice for a goal before." Over the last 20 years, the Gamblers have collected 119,888 teddy bears that have been donated to local hospitals and other charities across Northeast Wisconsin. "It's real special, you know?" Prokop said. "Anytime you can put a smile on somebody's face, it just helps you out a little bit, warms you up inside."